As one brotherhood is reunited, another is broken with the announcement of the roster shuffle just a day after the ESL One Birmingham Major. After an obviously disappointing run at the ESL One Birmingham Major, it was clear Evil Geniuses needed to step up their game and perform beyond expectations at the China Super Major to nab a direct invite to The International 2018. Rather than doing so, they decided to switch things up and rework their roster once again in this season of the Dota Pro Circuit. Rumors were already flying around that serious changes were coming, and they only became more realistic after the team announced the release of Rasmus ‘MiSeRy’ Filipsen and Clinton ‘Fear’ Loomis. Less than a day after this announcement, both EG and OG simultaneously released the changes to their rosters. This marks the first time that the duo of Johan "N0tail" Sundstein and Tal "Fly" Aizik has been separated since the formation of OG (previously Monkey Business). However, it also marks the reunion of the support duo of Andreas “Cr1t-” Nielsen and Tal "Fly" Aizik, the former of which played on the first iteration of OG. Furthermore, EG's star player Sumail “SumaiL” Hassan will return to his mid-lane while the two new additions fill in the open slots. This is the hardest part of the season for every team that doesn't achieve the goals set for themselves. At EG, we had to take a hard look at how to get back to competing at the level we expect of ourselves. As for OG, no further announcement has been made as to who will be replacing the players that have been released. It is also unclear whether Sébastien "7ckngMad" Debs will remain on the active roster of the team or move back to coach. However, they have made it clear that they will be withdrawing from the China Super Major to focus on the Open Qualifiers of the International 8. I would like to thank everyone that is OG and has been part of OG. These 2 years of hard work and success have been very tough but also so rewarding. I’m sad but also excited about what’s to come. I would like to wish OG best of luck in the future, fighting! Will EG find greater success with this roster? 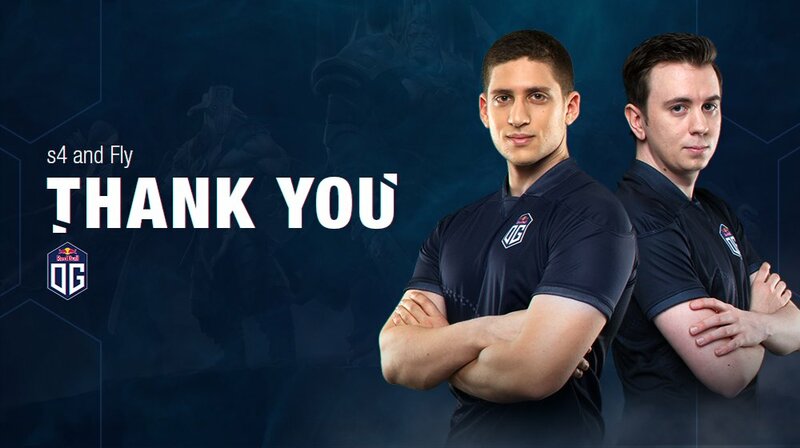 Yes, Sumail back to mid and Fly/Cr1t reunited! thanks god too. but feelsbadman for Jerax. He is clearly better than Cr1t right now. Does this mean that - the rest of the teams in DPC points list are automatically qualified now? No, there is still a chance for VGJ.Storm and Na'Vi to make it. Navi cant as Navi did a roster change recently as well (LeBron replaced by Velheor). Technically speaking, only up to position 6 is safe. But 7th and 8th position in the dpc ranking can still get kicked out. Thats assuming VGJStorm/Optic gets 2nd place in supermajor and other teams outside top 8 (like FlyToMoon, etc) win the supermajor. Optic might play at the Supermajor if am not mistaken. With OG withdrawing from the tournament, there is a good chance they might replace them. However China being China, they might invite a tier 2 Chinese team like Keen or something. Even The Final Tribe and Team Spirit have a slim chance i.e if they win the super major. 1st place at the supermajor is almost 3300 points for the team. So the contenders for the 4 to 8 are Newbee, Mineski, VG Thunder, Vici Gaming, TNC, The Final Trible and Team Spirit. Both Navi and VGJ Storm have to go through open qualifiers. Navi kicked LeBron and VGJ Storm recruited Resolution. And Optic is NOT in SuperMajor. VGJ Thunder is now at #8 with 1935 points. And Newbee is #7 at 2445 points. Getting 1st place at SuperMajor nets teams about 3375 points and 2nd place about 2025 points. If VGJ Thunder or/and Newbee get knocked out early and IF TNC, Infamous, TFT or Team Spirit can cllinch either 1st place or 2nd; they get the invite. Improbable but not impossible.